Constructed wetlands technology is emerging as a low-cost, easily operated, efficient alternative to conventional treatment systems. Specifically designed for wastewater treatment, constructed wetlands allow for a high degree of flexibility in design. They are not subject to the (jurisdictional wetland) laws and regulations that govern natural wetlands. A constructed wetlands treatment system (CWTS) is a bed composed of the substrate, water-tolerant plants, the water column, and a microbial population. The substrate can be sand, gravel, or soil in which wetland plants are growing. Various plant species can be used in a constructed wetland system. However, naturally occurring plants, such as the common reed, will most likely adapt to the local climate and soil conditions and provide successful treatment. The plants supply oxygen and other nutrients that promote microbial growth in the substrate. It is the microbial population that is largely responsible for treatment in the constructed wetland. In general, there are two types of CWTSs. The first, the free water surface (FWS) is a shallow bed or channel with aquatic vegetation. The contaminated water to be treated in this system is exposed to the atmosphere. The second type is a subsurface flow (SF) wetland in which the water to be treated is not exposed to the atmosphere. An SF wetland is a bed of permeable media that supports the root system of vegetation. The water level is maintained below the top of the treatment media (subsurface). A complex matrix of distinct aerobic and anaerobic treatment zones becomes established, which improves wastewater treatment. Construction Considerations. Construction of either type of wetlands involves about the same degree of planning and complexity of design. Treatment. Although either type can be effective in treating contaminated water under favorable conditions, the SF wetlands is more appropriate in cold climates. Area. In an FWS wetland, the bed is saturated with water, which does not encourage deep root penetration by the vegetation in the bed. As a result, since oxygen transfer is limited to a small portion at the top of the bed, FWS wetlands require a greater area than SF wetlands for the same degree of water treatment. Cost. Only a limited amount of reliable cost data for CWTSs is available. The cost varies, depending on wastewater characteristics, the type of wetland system, and the type of cell preparation required. Nonetheless, construction, operation, and maintenance costs suggest that subsurface flow systems are generally more expensive than free water surface systems on an equal area basis. However, because FWS wetlands require a greater area, the overall cost of these systems might be somewhat higher. Climate. The processes by which water contamination is reduced in constructed wetlands include volatilization, adsorption, precipitation, ion exchange, chemical reaction, and biodegradation. As the ambient temperature drops, volatilization and biological activity are reduced. Therefore, a cold climate will affect the efficiency of an FWS wetland more than it will an SF wetland, where the upper part of the bed insulates the microbial population. Exposure to Contaminants. An SF wetland is more effective in reducing the potential exposure of humans and wildlife to contaminated water. 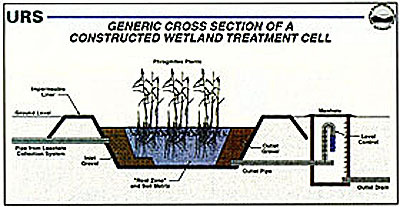 A wastewater treatment technique often used with an SF wetland is the root zone method (RZM). The root zone method uses soil as the medium for the filtration and treatment of impurities found in wastewater. Using soil as a growth medium offers advantages over gravel or sand. First, since soil has a much greater surface area than an equivalent volume of sand or gravel, it can support larger colonies of micro-organisms, resulting in a more efficient treatment system. Secondly, the soil that is selected contains actively charged clay minerals and organic substances (humus materials). These substances can adsorb impurities such as heavy metals, phosphates, and nitrates. Reeds planted in soil create and maintain the conditions for a complex community of microorganisms. Aerobic and anaerobic microbes are found in the ecosystem established within a root zone soil matrix. There are approximately 10,000 different microbial species within root zone soils, many of them found only under such unique conditions. The RZM and the subsurface flow system are used more widely in Europe than in the United States. In particular, Denmark, West Germany, Austria, and Switzerland use it frequently to treat screened raw sewage or primary effluent. In North America and the United Kingdom, gravel- or rock-filled trenches or beds are used for the treatment of primary or secondary effluent. For more information, contact Charles E. Dusel, Jr., Project Manager, and Craig W. Pawlewski, Chemical Engineer, URS Greiner, Inc., Buffalo, NY, (716)856-5636.